Devi Nidhi Saraswat is an Indian International Bhagavat Geeta Scholar. She is the recipient of Peace & Harmony Award and International Bhagavad Geeta Scholar Award. 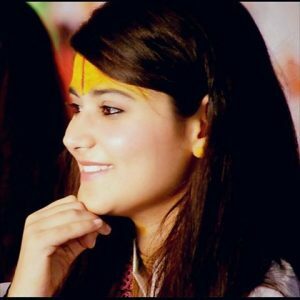 Born Nidhi Sharma on 26 june, 1996 in Aligarh, Uttar Pradesh, into Brahmin family, her parents are Poonam Sharma and Vinod Sharma. She was raised with her younger sister Devi Neha Saraswat. She was taught Bhagavad Geeta by her grandfather from very early age. *She was born in Aligarh, Uttar Pradesh on 26 june, 1996. *She belongs to Bhramin Family. *She began preasing Bhagavad Geeta at the age of 7.